Visit our brand new interactive digital magazines on your mobile with links to advertisers websites, movie trailers, book movie tickets, events and much more! With Over 70 Years Experience in the Garden Machinery Trade Your In Good Hands! Direct Local South Glos is hand delivered to selected homes and businesses in Patchway, Bradley Stoke, Thornbury, Chipping Sodbury, Yate, and surrounding areas. for everyone young or old so go and enjoy www.directlocalbristol.co.uk month it.. www.directlocalwebsites.co.uk Disclaimer The opinions expressed in Direct Local do not necessarily reflect Do you have any local news to share? 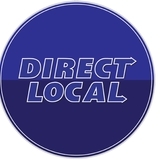 If yes get in touch with us and we will put it in our next edition free just give Mike a call or email info@directlocalonline.com subject to space available. those of the editor, publisher or their agents. Whilst every reasonable care is taken to ensure the accuracy of information included within this publication, the publisher takes no responsibility for errors or omissions in Direct Local. The content of Direct Local is not to be reproduced in any form without permission of the publisher. Please pass to a friend, recycle or compost. All adverts designed by Direct Local are the property of Direct Local please contact us if you wish to reprint them in other publications as a small release fee Is applied. Use of adverts designed by us will need written permission first. Plus All Your Other Waste Removal Needs too! On Average cheaper than a skip. HURRY ONLY FOR A LIMITED TIME! Your Garden In April Spring should be well under way this month with daffodils in full flow, their bright flowers enough to cheer up any day. Blossom trees will be blooming and fresh growth will be appearing on plants everywhere. “April showers’ are common but don’t be deceived by sudden bursts of rainfall – you may need to start watering plants more regularly on dry, bright and windy days. With longer days and stronger sunshine growing conditions are continually improving and the warmer weather will give us all the opportunity to get busy in our gardens. Care for your lawn The lawn will need regular mowing from now until autumn. Get some maintenance carried out to your lawn mower to ensure it stays in good running order – at the very least your mower blades should be newly sharpened ready for regular use. Keep the edges of the lawn tidy after mowing with a sharp pair of shears or a lawn edger. Don’t forget to give the lawn a spring feed after mowing if you haven’t got around to doing it yet. If a more drastic approach is needed to spruce up your lawn, sowing seeds for new lawns or over seeding dead patches can be carried out from mid-April onwards. 3 Essential gardening jobs for March Sow hardy annuals Hardy annuals are plants that can be sown from seed in the open ground. Get them off to an early start by sowing in pots or modules. Modular trays are also handy for sowing summer bedding plants such as marigolds, lobelia and petunias. Label each seed tray and once they are growing put them outside when the weather is warm day and night. Support climbers Climbing plants should be growing rapidly now, so will need ample support for new growth. Extend or replace trellis as necessary or add more wire to archers and tripods. New shoots will need to be gently encouraged sideways as they grow. This will send vital growth hormones doing the length of the shoot rather than just to the tip and so will encourage flowering all over the plant. The rest of the garden will also be growing well now, so if you have been putting off carrying out any major pruning then now is the time to bite the bullet and get it done. Trees, shrubs and hedges should be cut back now before birds begin to nest. Why should you plant them? Ancient Greek meaning “Rose tree’ the rhododendron family includes azaleas. These stunning shrubs flower in all sorts of vibrant colours and can help brighten those difficult dark spots in your garden. Rhododendrons are grown for their spectacular flowers usually borne in spring, although some – the deciduous rhododendron or azaleas have good autumn colour. How should you plant them? In the wild rhododendrons are woodland plants, so they prefer dappled sunshine and can manage well in shade. They like plenty of water however and will not do well in boggy or badly draining soil, so drainage is key. Plant in autumn or spring and use ericaceous compost. ‘Banned’ parking enforcement cars with CCTV are still being used in Bristol CCTV enforcement cars operated by two local councils have caught more than 800 motorists parked illegally this year – an average of 11 each day. The government banned mobile enforcement vehicles three years ago due to the fact that other local authorities were accused of ‘over-zealous’ parking enforcement. But some councils continue to use then under exception in the ruling which allow the use of the cars outside schools, at bus stops and on red routes. Responding to Freedom of Information Act Requests, Bristol City Council said it issued 173 tickets so far this year using a mobile enforcement vehicle, while South Gloucestershire Council issued 660. In Bristol, 63 tickets were issued to motorists parked illegally in Upper Maudlin Street, which goes past Bristol Royal Infirmary for Children in the city centre. Also among them were 37 tickets were issued in East Park in Eastville, 23 in Stapleton Road, and eight in Whiteladies Road. In South Gloucestershire, most of the tickets, 163 were posted to motorists who had parked at bus stops in Alma Road in Kingswood – round the corner from the council’s office. Elsewhere, 134 tickets were issued to motorists parked at bus stops in Hanham Road, in Hanham, and 22 for motorists leaving cars a stops on the A38 in Almondsbury. APRIL IS FULL OF BLOCK BUSTER MOVIES AT CINEWORLD April is when we can officially say that it’s getting dangerously close to summer blockbuster season – to the point that major superhero releases like Avengers: Endgame and Shazam! begin to creep in. It’s not just capes spandex April brings with it, however, but ancient demons and cowboys, too. Let’s dive in! Kicking us off on April 5th is an interesting double-bill, with Shazam! & The Sisters Brothers both hitting the silver screen. Shazam! looks set to answer a fabled question: what would a youngster do if they got superpowers? Whatever it is they will soon get put to the test, as the boy-turned man superhero is forced to square off against Dr. Thaddeus Savanna. Meanwhile, The Sisters Brothers takes us back to the Old West, where a gold prospector is chased by the infamous duo of assassins. Then, a week later on April 11th, we return to the new iteration of Hellboy. This time played by Stranger Things’ David Harbour, the hell-born demon hunter will need to do all it takes to prevent Mila Jovovich’s evil blood queen from destroying the Earth. Finally, Earth’s mightiest heroes unite once more on April 25th in an attempt to reverse the effects of Thanos’ snap in Avengers: Endgame. But will they be more successful this time around? Lastly don’t forget, Cineworld Yate and Direct Local Bristol have teamed up to give readers a chance to win two free cinema tickets. Simply fill out the next page word search. It doesn’t matter if the sun isn’t shining, the heavy-hitters are all coming to town. Just be sure you have your popcorn and ice blast in hand when you come to see them at Cineworld. 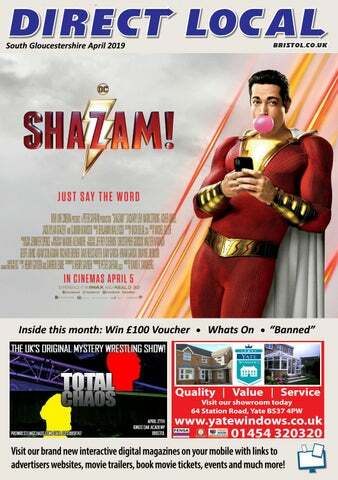 Article by Aaron Potter who is a professional writer for Cineworld Bristol and places these articles in Direct Local each month to give you the public a choice of great movies to view at your local cinema. Minimum 12 month subscription. Exclusions apply. Uplifts payable where applicable. Higher monthly fee for West End cinemas. Full terms available at cineworld.com/terms/unlimited-card. All the details of the entrants will be stored for 2 months securely and NOT be shared with any other third parties except for the winner of the competition in which Cineworld Yate or P.W.C will need the details to contact the winner to collect the prize. 1. Preheat the oven to 180C/ Fan 160C. Line two baking tray with baking paper. 2. Mash the bananas and melted butter together. 3. Tip the oats, dates, almonds, coconut and baking powder in a bowl and mix 4. Combine the wet and dry ingredients together. 5. Scoop up dessert spoons of the mixture in your hands, roll into a ball then flatten out into biscuits about 4cm diameter. 6. Ask an adult to help place the trays in the oven and bake for 15-20 minutes until golden. 7. Leave to cool for a few minutes then transfer to a cooling rack. 8. Can be frozen in an airtight container for up to one month. Incomes tax changes for April. These laws can have a big effect on your bank balance. From pay rises to new VAT rules, there’s a whole raft of new laws coming into force which everyone will have to adhere to . Business Advice Professional business advice to help set you on the path to growth and success. This is included within our services as standard. Free Initial Consultation We offer a free initial consultation to assess the level of accountancy services you require. The income tax threshold will be increased to £12,500 in April 2019. In other words, you will not have to any income tax at all until you earn this much. Assuming you have an annual income of at least £12,500. And the threshold for the higher rate of income tax40% rate – will increase to £50,000-a-year. It means that some people on higher salaries (more than £46,351-a-year) will also gain. Every year, changes to our financial laws approved Payslips by the Government begin in April. Some of them From April 6, 2019, the legal right to a pay slip will be could a pretty big and direct impact to your bank extended to include non-employees such as balance so it’s worth knowing about. contractor and freelancers. Employers will also be obliged to include the total number of hours worked Pay rise on payslips for employees whose wages vary Both the National Living Wage (NLW) and National depending on how much time they have worked. Minimum Wage (NMW) rates will increase in April 2019. The “living wage”, the effective minimum wage for From April 2019, all VAT-registered businesses with people aged 25 or over, will rise to £8.21 next April, taxable turnover above the VAT registration threshold will have to keep VAT records in digital form and up from£7.38 an hour now. file their VAT returns using software. Visit www.techvolution.co.uk for all your making tax Many people will be able to keep more of the digital needs. money they earn. If you have any questions and are looking for genuine assistance Chartered Certified Accountants – TSA Accountants Bristol Ltd work closely with Techvolution - a reseller of Neetrix Business Software – which is recognised by the HMRC. The HMRC has implemented this to ensure taxes are collected and so the HMRC are more efficient. It has not put MTD in place to enable software providers, bookkeepers and accountants to use it to make excess profits on the back of it. Why does this matter? Caught by the pension tax trap? Those looking to cash in part, or all, of their personal pension need to check they don’t pay too much tax. The emergency tax code is still applied, but this triggers HMRC to adjust your tax code and send an updated version to your pension provider. Once the new code has been issued, any further, larger withdrawals are taxed correctly. Pension freedom rules allow anyone aged 55 or over to access their personal pension funds, there are complex rules on how withdrawals are taxed. Problems can occur if you take a one-off lump sum – an ‘uncrystallised fund pension lump sum withdrawal’ (UFPLS) – perhaps to reinvest or to pay off debts. This differs from using a personal pension to provide a regular income, through a drawdown plan or annuity. Your pension provider will apply an emergency tax code, which assumes you are withdrawing the UFPLS on a monthly basis, unless it has an up-to date tax code for you. As emergency tax codes are generally only applied the first-time people access their pension funds, one option is to make your first withdrawal a nominal amount, say £100. You may be able to claim a rebate, either through your tax return at the end of the tax year, or HMRC if you need the rebate more quickly. If you are planning to withdraw a lump sum from your pension contact Bristol & West financial services. The Financial Conduct Authority does not regulate tax advice. Levels and bases of taxation and tax reliefs are subject to change and their value depends on individual circumstances. Tax laws can change. For example, if you take a UFPLS of £10,000 at the start of the tax year, HMRC may assume you will take an income of £120,000 across the year from your pension and tax you accordingly. If it is a one-off withdrawal, you are likely to pay too much tax. Price includes individual consultation and your will being professionally produced by Goodwills legal Services ltd, a regulated law firm. Call In The Experts To Get Your Home Improvments Under Way Today! Celtic Tree Zodiac Birth month January Relationships are important at this time. Maybe time for thinking of having a break, even a short getaway would help to recharge the batteries. There may be some important meetings for you at this time also. Keywords. Relationships and relaxation Birth month February There seems to be something you have been putting off that really should be dealt with now, once sorted, you will feel a lot better .Sociability is highlighted at this time. If you are currently in a romantic relationship this is also highlighted and if you are single then this may be time for things to change. Keywords sociability and relationships Birth month March Time to check you are having a balanced life. May also be time to clear things out emotionally as well as physically. Maybe time to pick up with an old interest or hobby. Possibly some study. Keywords. Balance and clearing. Birth month April Looks like some changes are coming your way. Some paperwork and files need your attention. Things are looking busy this month, try not to do too much, and find some balance for yourself. Keywords. Changes and balance Birth month May Relationships and moments are highlighted at this time. If something seems to be held up you will find they are beginning to move forward very soon. New things are on the horizon for you. Keywords. Relationships and new things. Birth month June If you have a tendency to dig your heels in, it may be an idea to try and be a little more flexible, and sensitive to other’s needs. You can be very resourceful and a situation may arise where your abilities would be useful. Remember you don’t have to carry the weight of the world on your shoulders, sometimes sharing things can be helpful. Keywords flexibility and sensitivity Birth month July There may be a few things that seem to be being held up, it may be helpful to go through sorting out some things on the physical level, and possibly also within yourself. Don’t give yourself A hard time, be sensitive to your needs and the needs of others. Keywords clearing and sensitivity. We paint your windows, doors and conservatories any colour of the rainbow! A paint product designed to retain pigment and not fade year after year, after year. Protection against ultra-violet radiation reduces deterioration from exposure to sun. Advanced paint technology provides resistance to friction and physical damage. We'll match your colour to any colour system including RAL, BS or Farrow & Ball. Just bring us your swatch or sample. © ENVIRODEC SW LTD trading as The uPVC Sprayers. Company number 08297455. Registered in England and Wales.